CALLED the "Arrowplane" by its designer, Waldo Water, man, an interesting tailless aeroplane has recently been tested at Los Angeles before officials of the American Department of Commerce. The top speed claimed ДальшеMore>>> is 114 m.p.h., landing speed 40 m.p.h., landing run 30ft., and the machine is said to be practically impossible to spin. The engine, used as a pusher, is a 4-cylinder inverted 95 h.p. Menasco. 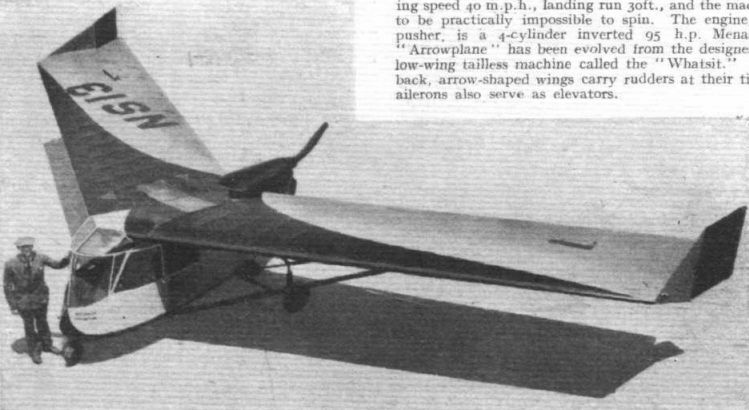 The "Arrowplane" has been evolved from the designer's previous low-wing tailless machine called the "Whatsit." The sweptback, arrow-shaped wings carry rudders at their tips, and the ailerons also serve as elevators. SAFETY FIRST: The more important features of the tailless Waterman "Arrowplane" can be seen in this photograph.